Join the discussion on our forums! Come discuss Thunderhead over in our dedicated Thunderhead discussion topic. Most of his friends are still Metalheads. Probably my favorite Shaman card from this expansion. The tempo swings this card allows are insane! This is basically shaman's Flamewaker. Costs 1 mana more but has +1/+1 in stats. Can't deal face damage on the first turn but can choose the target minion to damage and can keep the Sparks alive if you want. Is it just me or does this card not say "this turn". So if you overload does this upgrade like spell stone, or is it like flabidinous floop where it carries over to the next turn? If it has to be done right after playing an overload then it's decent. If it carries over from turn to turn then it's amazing. You have to play the Overload AFTER you play Thunderhead. 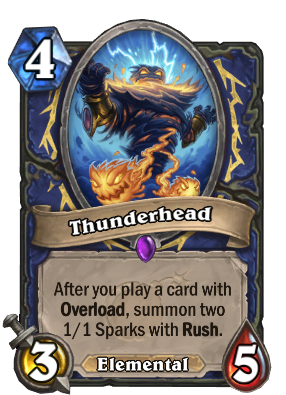 Wow look at that, a card with Overload and Elemental synergy that has a good effect, finally. Thunderhead + Voltaic Burst + Zap! + Flametongue Totem = 20 self-directed damage to enemy minions for only 7 mana, and it leaves you with two cards on the board that your opponent has to get rid of. Not to mention if you don't need to kill off all the sparks, leaving just 3 alive you can do 25 damage to face next turn with a single Bloodlust provided your opponent has no AoE. I think this will be pretty good. what? why two? one with rush or two with no text on it. It summons the same thing that Voltaic Burst does, that being two 1/1s with rush. Sparky sparky boom man, is that you? Could become a very powerful card in arena depending on draft. So has a lot of potential but probably not enough to make it good enough to see play. Do they spawn on the left or right side? or both? Very important for flametongue totem direwolf alpha etc. If they spawn to the right this WILL be played somewhere an perhaps even an aggro list can be spawned. Very good for board control, Fungelmancer, Bloodlust. Good minion generation in general has always been good for Shaman. So we are coming back to swarming enemies board on shaman too? I guess Bloodlust was missed. Wow! This card looks awesome!! 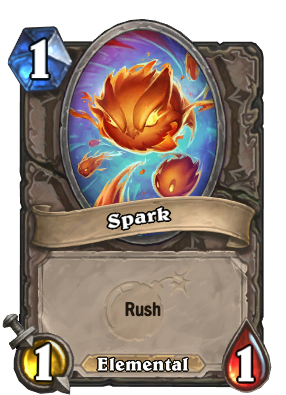 Perhaps the 1/1 sparks might have some other synergy? Otherwise I think this card could definitely be playable. maybe the legendary spell is gonna have something to do with elementals, then this card is gonna be pretty lit. fire as hell.